For this week's blogging challenge I reviewed the master list of important dates (e.g., births, marriages, deaths, etc.) in my family tree of about 2000 people. What stood out for me on February 14th, Valentine's Day, was the death of one-year-old Edward Pawlowski in 1907. This is his story. Edward Pawlowski is my first cousin twice removed. His parents, seated in the wedding photo below, were John Pawlowski (1882-1920) and Paulina Grzeskowiak Pawlowski (1883-1941). They were married in November of 1904 and I am biologically related to both of them. As the brother of my great grandfather, Adam Pawlowski (1879-1959), John is my 2nd great uncle. As the sister of my great grandmother, Marianna Grzeskowiak (1879-1941), Paulina is my 2nd great aunt. Two Pawlowski brothers married two Grzeskowiak sisters. I don't know who the couple standing is, but I do know they aren't my great grandparents. John Pawlowski and Paulina Grzeskowiak Pawlowski wedding (1904). John and Paulina were married in November of 1904. Edward, their first child, was born before their first anniversary in October 1905. 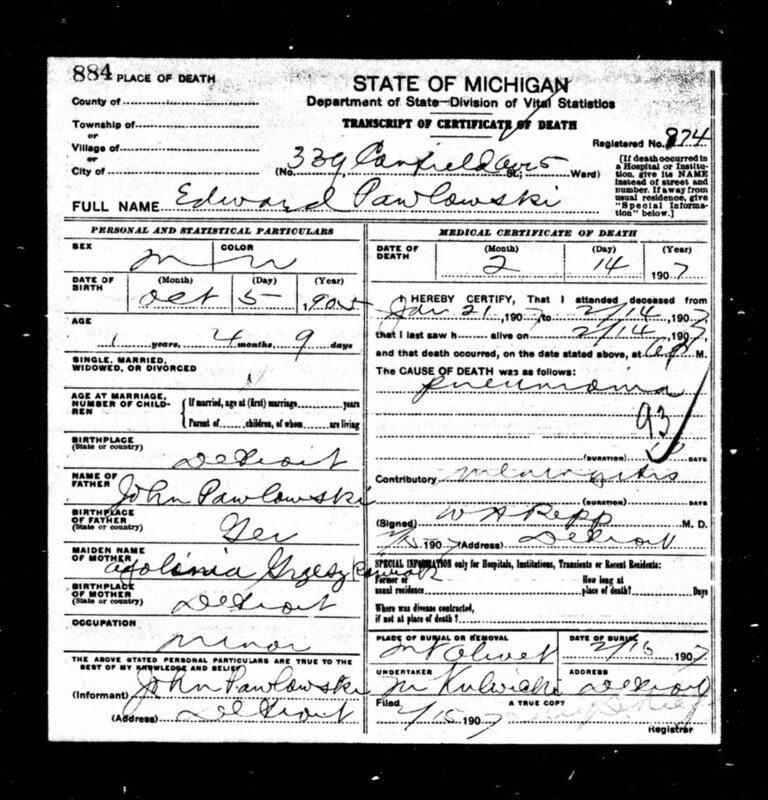 The only records I have for Edward's short life are his death certificate (below) and his Find A Grave memorial. At the time of his death Edward was only one year, four months, and nine days old. The cause of death is listed as pneumonia with meningitis as a contributing factor. Edward is buried at Mt. Olivet cemetery in Detroit, Michigan, though I do not remember seeing a grave marker for him on my last visit. It is possible that he is unmarked somewhere in the family plot or perhaps buried in another part of the cemetery. 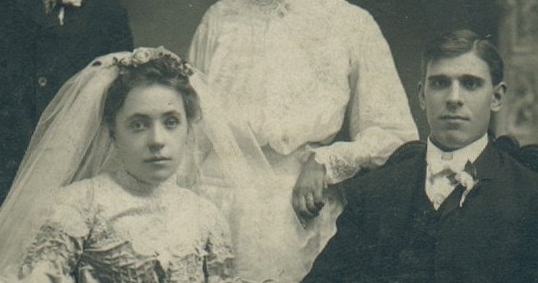 Early 1900s wedding photographs aren't known for their joviality. It is hard though, given what I know now, not to read some prescient sadness into the faces of John and Paulina. While of course they couldn't know, I do wonder if somehow they sensed tragedy was to befall them. Before their third anniversary their first born child would be dead. At the time of Edward's death, Paulina was likely about seven months pregnant. Theresa Pawlowski (1907-1976), John and Paulina's second child, was born two months after her brother's death. Are their any photos of Edward? Is his birth certificate available? Was he sickly? What about a baptismal certificate? Are their any newspaper announcements of his death or funeral? Losing a child, unfortunately, was not uncommon in the early 1900s. How did this loss impact John and Paulina? Did the loss of Edward impact Paulina's capacity to mother her newborn daughter, Theresa, two months later? How about John as a father? How does bereavement differ from complicated grief? What about postpartum depression? How would people in the early 1900s think of these mental health issues as we conceptualize them today? This is the 7th of 52 weekly posts planned for 2018. It was inspired by the #52Ancestors writing challenge issued by professional genealogist, Amy Crow Johnson. The challenge: once a week, for all 52 weeks of the year, write about a relative in your family tree. Genealogy blogging led me to the discovery of this beautiful photograph of my 3rd great grandparents, Carl Schmidt and Ernestina Zenner Schmidt (d. 1922), and their 8 children. Here is how. Eerily similar tragedies befell the Costlow family of Johnstown, Pennsylvania on June 15th of 1930 and November 3rd of 1958. Anthony Joseph Costlow (1897-1930) and his son, James J. Costlow (1921-1958), were both electrocuted while working in the same steel mill. These are their stories. Alma Ratz Hanley (1894-1979) was one of my paternal great grandmothers. She is also the subject of this 49th installment of my 52 Ancestors in 52 Weeks family history blogging challenge. I hope you enjoy this photo essay about her life. James J. Halvis (1896-1987) was my 1st cousin 3x removed. Until now there had been an unclear connection between his family and my own Halvangis line. Here is the story of how this Greek mystery was solved. James William Halvangis (1920-1973), my maternal grandfather, was the only one of my four grandparents who died before I was born. I’ve enjoyed “meeting” him through photographs. I hope you will too. The beard of David Costlow (1853-1924) is a soft and greying cloud in active weather. David’s calm eyes rest contemplatively above a yard that teeters tenuously between kempt and neglect. Marie Zuchowska Pawlowski was my 2nd great grandmother. Born around 1851 in what is present day Poland, she came to the U.S. with her husband, Baltazar, in 1907. They settled in Detroit, MI to join their children. This is her story. In 1925 two recent Greek immigrant brothers, Nicholas and Angelos Tsardoulias, purchased and began operating the Hotel James in Greenville, Ohio. They are likely cousins of mine. This is their story.